The fourth goal involved one very long day, and a very long hike, up and around the resurgent dome of the caldera . The idea was to get as familiar as possible with the facies associated with the dome and the structures associated with the collapse. 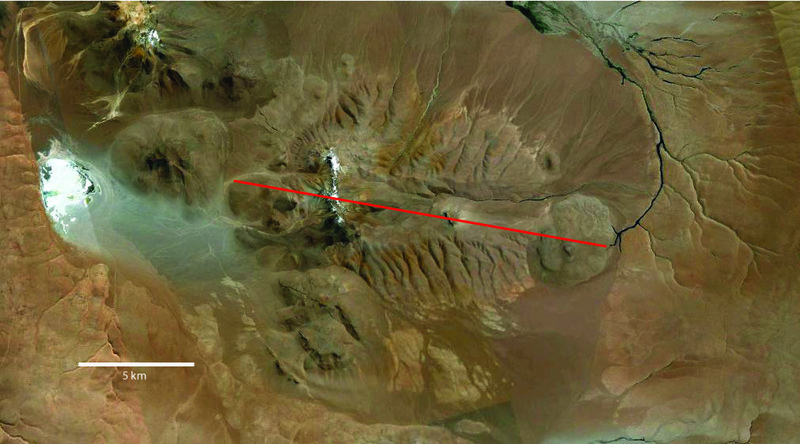 Above is a map of the resurgent dome, some of the lava domes are visible to the northwest. The red line indicates the placement of the cross sectional view below. An East-West profile of the resurgent dome. The small flat block in the middle is likely a remnant feature from prior to the collapse of the dome. The small hump the the East is a post-resurgent dome named Sombrieta. Views of the resurgent dome collapse from the East. On the left, the small flat block (sombriacita) is visible. On the right is a look at the internal structure of the dome. Lava flows that likely post-date collapse can be seen draping the collapse features. Looking southeast from the resurgent dome to Volcan Uturuncu over 80km away. Uturuncu is an active strato volcano in the back-arc of this region. We met a lot of geologists and geophysicists working on and around Volcan Uturuncu. While working on the resurgent dome we made it over the 5000m elevation mark! The peak of the resurgent dome is over 5700m (18,700ft) elevation.